The presence of complete, accurate and accessible prisoners’ data is not only a prerequisite for effective prison management and strategic planning but also an essential tool for ensuring that the human rights of prisoners are upheld. ePrisons is the complete system for information management about prisons and prisoners and it is developed in compliance with the requirements of international standards. Every confined person is registered in the ePrisons system. The system covers all aspects of a prisoner’s imprisonment from the initial registration until prisoner’s release. ePrisons is information system used in every prison of the Country. System enables to keep records of every person held in custody. It contains clear and functional system for recording information, accompanied by procedures that are respected and followed by prison staff. The system provides important information for prison managers to identify resource requirements, set budgets, manage health and safety and develop appropriate rehabilitative and treatment programs. Information about imprisoned person can be seen in any prison (or other authorized organization) and district of the Country. 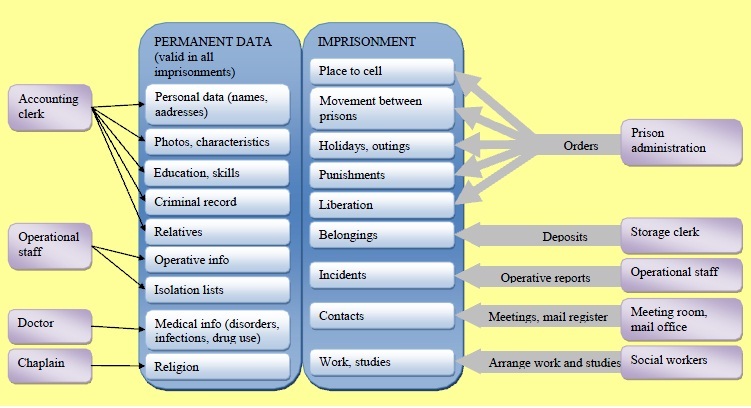 Every prisoner is uniquely identified in the system and if a person is committed to a prison repeatedly, existing information about him/her could be found and supplemented with information about new restrictions or imprisonment. In addition to information about inmates, information about their relatives, visitors, visits, parcels is also kept in the system. Depending on the given rights, system users can enter, save or change information in ePrisons and use the powerful query engine to obtain necessary data about the prisoner.